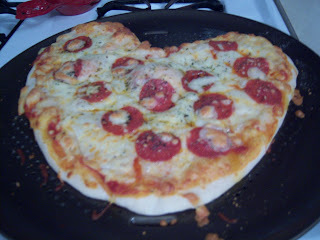 Valentine's Day - Heart Shaped Pizza! Ever since our first Valentine's Day together (2001) my boyfriend, then finance and now husband and I have had pizza for dinner on almost every v-day. I just don't usually get too in to Valentine's Day, probably because my birthday is 3 days before! Anyway, why would this year be any different? In a way it was. This was our first Valentine's Day in our home. Because of that I could have made a nice, fancy meal but why mess with success! For the first time on Valentine's Day, however, I did make my own pizza, rather than calling Pizza Hut! To be all cutsey I decided to shape the pizza like a heart. I didn't think I would be able to because I have a hard enough time shaping the pizza dough like a pizza! I was plesantly surprised at how easy it was! I will post pictures soon... I don't have the pictures on my work computer!